IAEA and University of Tasmania Sign Practical Arrangements Agreement to Enhance Cooperation in Human Health, Agriculture, Environment and Marine Sciences Omar Yusuf, IAEA Department of Technical Cooperation On 12 December, the IAEA and the University of Tasmania (UTAS) signed a Practical Arrangement which provides a framework for closer collaboration in the areas of health, agriculture and the marine environment. The agreement – the first signed between the two organizations – covers the period of 2018 to 2021. 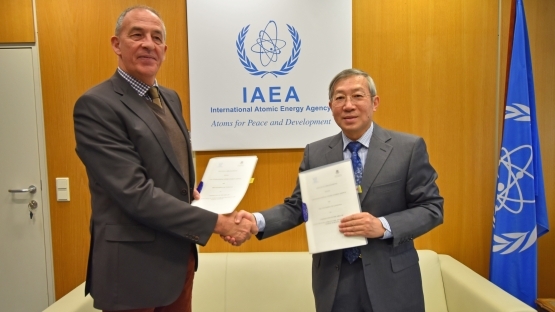 Under the new agreement, UTAS will support the IAEA’s technical cooperation efforts by providing both short- and long-term training programmes in the peaceful application of nuclear science, especially in the fields of human health and nutrition, nuclear medicine, agriculture, environment and marine sciences. Both parties will disseminate and exchange relevant educational material and evidence-based practices, and will work together to promote the application of nuclear technologies in human, social and scientific development. The first two-week course was attended by 26 teachers from 17 countries. The course comprised presentations, laboratory work and technical visits to Indonesia’s National Atomic Energy Agency (Batan). It also served a good opportunity for teachers from different countries to network and exchange experiences in teaching. The IAEA said the course marks the first time that it had formally engaged with the secondary education teaching community. The participants were introduced to diverse methods of teaching nuclear science and technology to children aged 12-18 in an effective and engaging manner. The IAEA said it hoped the attendees will become mentors to other teachers in their countries. “This way, the project aims to reach one million students by 2021,” it said. Between 2012 and 2016, the IAEA and experts from Australia, India, Israel, Japan, South Korea and the USA developed a compendium that collects unique teaching strategies and materials to introduce science and technology in education systems across Asian countries. This compendium was piloted in Indonesia, Malaysia, the Philippines and the UAE and reached 24,000 students. The IAEA said the pilot demonstrated that students “were more receptive to learning about nuclear science and technology when teachers used a diverse set of methods, which also increased their problem-solving skills”. South Australia’s academic bigwigs infected with pronuclear delusions. UniSA Chancellor Jim McDowell is also Chair of the ANSTO Board & ex-CEO of BAE. 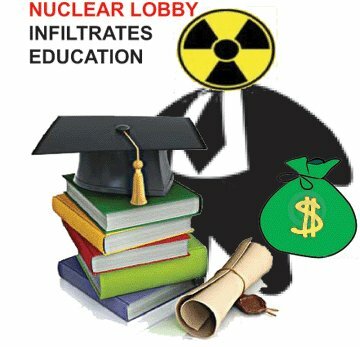 AdUni Chancellor is Nuclear Fuel Chain Royal Commissioner Kevin Scarce. University of Adelaide and UniSA in merger talks, InDaily, Bension Siebert- 19 June 18 The University of Adelaide and UniSA have announced historic talks to merge into a single university which they claim could be immediately placed within the world’s top 100 universities. The governing councils of both universities have agreed to a six-month “period of collaboration” to negotiate a potential merger, according to a joint statement released by the universities today. University of Adelaide Vice-Chancellor Professor Peter Rathjen and UniSA Vice-Chancellor David Lloyd will oversee a joint report into the prospective merger, to be delivered by the end of the year. The university councils will decide on the viability and merits of a merger at that time. In a joint statement, University of Adelaide Chancellor Kevin Scarce and UniSA Chancellor Jim McDowell say now is the right time to consider joining together as a single university. “Now is the time to facilitate a conversation about whether uniting our universities would create a new internationally renowned university of scale that would be well placed to anticipate and respond to this changing landscape,” the statement reads…….. Merging the Adelaide University and UniSA was an ambition of former Labor Premier Jay Weatherill in 2015, but universities and both sides of federal politics were opposed to the idea. ……..